Adapted from this recipe at Smitten Kitchen. Ingredient quantities are slightly reduced from the instructions in Deb’s recipe; for example, she specifies 6 eggs (I used five) and 3 potatoes (I used two). Otherwise, it’s fairly straightforward. A word of caution: go easy with the salt; it’s quite easy to oversalt just a touch, as I did in this case. Time: About one hour, including prep. 25 Mar	This entry was published on March 25, 2012 at 9:20 am. It’s filed under cooking, food, food photography, general, vegetarian and tagged breakfast, food photography, gluten-free, potatoes, Spanish food, vegetarian. Bookmark the permalink. Follow any comments here with the RSS feed for this post. Looks fantastic! I call this a frittata and after never ever eating one before – I have eaten 3 this month alone and intend to eat more of them! I use no salt but lots of garlic – you should try it. Hi there. Thanks for the comment. I just want to point out that while technically correct, a frittata in the modern sense differs from a tortilla de patatas. The latter is almost always made in a skillet and rarely does it contain anything other than potatoes, onions and eggs. Another difference is that a tortilla de patatas (or indeed, any tortilla) is cooked on both sides. The addition of garlic is not considered part of the traditional recipe. I don’t want to belabor the point, but frittatas and tortillas come in a range of varieties. 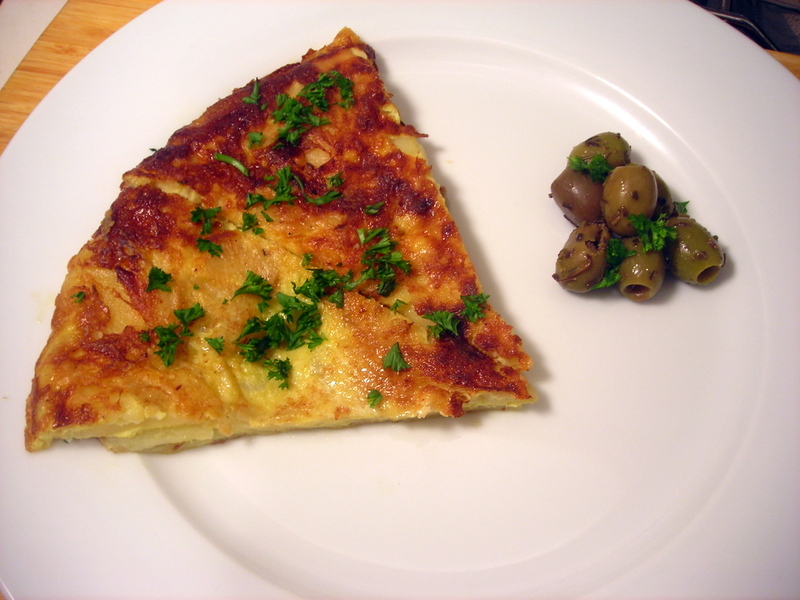 I am talking about a specific one, a tortilla de patatas (also known as a “potato omelette”). The traditional recipe for a tortilla de patatas is either potatoes and eggs, cooked in olive oil, or potatoes, onions and eggs. Most frittatas usually contain cheese, whereas a tortilla de patatas typically does not. Furthermore, frittatas are Italian in origin, a tortilla de patatas is Spanish. True, a frittata is cooked on both sides, but not in the manner that a tortilla is. The entire tortilla is flipped, once to cook the top; a second time to finish cooking the bottom; then flipped a third time at service. A frittata tends to be finished in an oven or under a broiler, and usually at the last few minutes prior to service. These are minute differences to be sure, but serve to illustrate some of the fundamental differences between a frittata and a tortilla. We’ll just have to respectfully disagree on this point, I’m afraid. The two terms are not interchangeable, in my opinion. It’s a little like calling boeuf à la Bourguignonne “beef stew”. Well, yes, you might be technically accurate, but it’s reductionist to the point of absurdity.